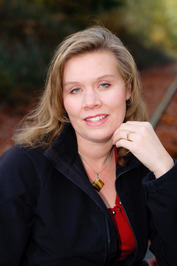 Today I have the pleasure of having Breaking Beautiful author Jennifer Shaw Wolf on the blog today. I read and really enjoyed Jennifer's debut novel. 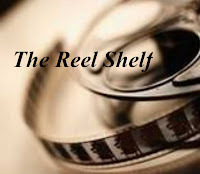 Be sure to check back on my review of the novel next week! 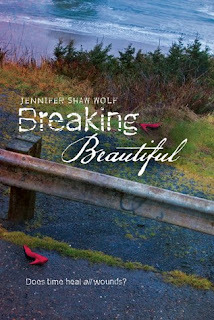 Breaking Beautiful will be released on April 24th, 2012. Hi, Jennifer! Thank you for stopping by the blog today. Can you describe your book for us in ten words or less? A tragic accident, a terrible secret, and a second chance. In Breaking Beautiful, Allie was involved in an abusive relationship. I'm glad there are more books out on this important issue for teens. What made you decide to put Allie in this situation? About four years ago, after many years of only writing in my head, I decided I was going to take my writing seriously. The first young adult book I read at that time was Sarah Dessen’s Dreamland which is also about a girl in an abusive relationship. I loved the book, but the thought of a girl trapped in that situation horrified me, especially because I was reading it as a mother. What would it be like to have a daughter in that situation and have no idea what was going on? I had that in my head when I started writing Breaking Beautiful. I want the stories I write to mean something, the way Sarah Dessen and Laurie Halse Anderson, Holly Cupala and so many other contemporary teen author’s books do. (Not that I would compare myself with any of them.) I love the idea of blending real-life issues with an entertaining story. The element of teaching without preaching is one of the best things (in my humble opinion) about contemporary young adult literature. Through Breaking Beautiful I want to make teen girls (and maybe even teen boys) more aware of the problem of dating abuse. I wanted to allow them to get inside the head of someone who feels like she’s all alone; that she can’t tell anyone what’s going on, not even the people who care the most about her. I wanted them to see things from her point of view and think about how they would handle the situation (hopefully differently). My hope is that stories like this will educate teen girls about abusive relationships and help to keep them safe. If I went to Blake's and Allie's homes, what type of books would I see on their bookshelves? Blake’s books would be an eclectic mix of art books, classics like Catcher in the Rye (a story he really liked but is afraid to admit it), popular books like The Hunger Games, mixed in with some graphic novels, and a few homeopathic and nutrition books his grandma is trying to get him to read. Allie doesn’t read much because it’s hard for her. She has a copy of Lord of the Flies she never read, but forgot to turn back into her English teacher. All of the paperback, teen-romancy books she read in middle school were given away by her mom the last time they moved, so her bookshelf is full of books that she rescued from her grandmother’s house. Some of those include: Wuthering Heights because her mother said it was a terrible book and Allie wanted to know what was so bad about it (she couldn’t get through it), Goodnight Moon, because she remembers her dad reading it to her when she was little, and Frog and Toad Are Friends because that’s the book she and her grandma spent a whole summer on, practicing her reading. The only book that has always gone with her wherever she moved is an old Grimm’s Fairy Tale book. She keeps it under her bed and has read it over and over, even throughout high school. My worst writing habit is the “slutty little novel” (not quite what it sounds like). It’s a term I heard from Laini Taylor when she spoke at one of the first SCBWI meetings I ever went to. I’ve now adopted it as my own. The “slutty little novel” is that idea that pops into your head while you’re in the middle of your current work in progress. It usually shows up when your work in progress gets hard to write or you feel stuck. Suddenly it seems like this grand new idea will be better and it is a distraction from your loyalties to the story you are currently writing. This distraction can lead to (in my case) about fourteen story ideas that are in various stages of development languishing on your hard drive. The way I deal with them now is I allow myself to write the outline and maybe a first chapter and then go back to what I was working on. However, it’s not always a bad thing, Breaking Beautiful started out as a slutty little novel. The tagline of your book is "Does time heal all wounds?" Do you believe time heals all wounds? Why or why not? I think the idea that “time heals all wounds” is a myth. In many cases, time just buries old wounds and they never really heal, especially if they aren’t talked about or given the chance to come out in the open. In this story, Allie has to face everything that happened to her before she can move on, feel good about herself, and really heal. I think that’s an important message for teens (and really anyone); we shouldn’t expect a problem to be solved or an emotional wound to be all better just because it happened a long time ago. Emotional wounds take support and often counseling before they can truly heal. Thank you so much for stopping by, Jennifer! Readers if you would like more information about Jennifer, please visit her website, her blog, Twitter, and on Goodreads. Allie lost everything the night her boyfriend, Trip, died in a horrible car accident—including her memory of the event. As their small town mourns his death, Allie is afraid to remember because doing so means delving into what she’s kept hidden for so long: the horrible reality of their abusive relationship. When the police reopen the investigation, it casts suspicion on Allie and her best friend, Blake, especially as their budding romance raises eyebrows around town. Allie knows she must tell the truth. Can she reach deep enough to remember that night so she can finally break free? Debut writer Jennifer Shaw Wolf takes readers on an emotional ride through the murky waters of love, shame, and, ultimately, forgiveness. Slutty little novel!!! I LOVE IT! I can just picture a novel trying to steal an author's attention away from their current project and tempting to try something new:) Love the book question too Rummanah, this was such a fabulous interview! I'm really looking forward to getting my hands on this one, Rummanah! I love contemporary novels that make you think without being all preachy. I had to laugh at the slutty little novel idea. Great book! Great questions! Great interview! Thanks. "A tragic accident, a terrible secret, and a second chance." You seriously got me with that and it was only the first question. ps. You should totally read the Downside Ghost series. It's one of my favorites! It's so different and Chess is such a different type of heroine. Plus, I just love the different voices of the people, especially Terrible. They really help deliver the novel and make me feel the atmosphere of Downside. LOVE IT! Thank you everyone for reading and responding here and thanks so much for having me Rummanah! I love the idea of a "slutty little novel." That applies to so many parts of my life. Slutty little thoughts - distracting me from whatever I'm doing...wow, that can really be taken the wrong way, but you get what I'm saying. Great interview! I've been waiting for this book to come out! Thanks for the interview Rummanah! Friendship on Fire Giveaway Winners!